The first Fine Wine of Ukraine – Shabo Wine. 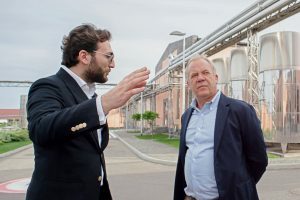 The legendary Stéphane Derenoncourt – the wine expert, who is, according to the magazine «Decanter», in the top of the best oenologists in the world, has visited « Shabo Winery» on May 10, 2018. The occasion of the visit was the Fine Wine of Shabo. The concept of Fine Wine is what distinguishes premium wines made by the best châteaux of France. Until recently, there were no such wines in Ukraine. The collaboration of “Shabo” with Stéphane Derenoncourt personally is dedicated to the creation of such terroir wines, with the potential of ageing for decades. After all, he has worked with such outstanding chateaux as Château La Gaffelière (Saint Emilion 1er Grand Cru Classé), Château Prieuré Lichine (Margaux), Château SmithHaut Lafitte (Pessac Léognan Cru classé de Graves), Château Talbot (Saint Julien Grand Cru Classé) and others. It is well known that Stéphane is very selective in the choice of partners, making the highest demands on the culture of viticulture and winemaking, therefore, not every winery can count on his support. Derenoncourt has been sure in the success of the «Shabo» company project. In the master’s opinion, the company is provided with the best winemaking equipment in the world, and a highly professional team of viticulturists and winemakers work here. 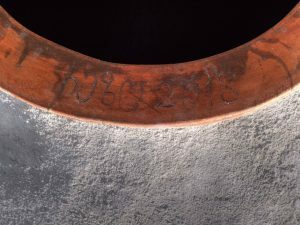 The terroir of Shabo, due to its originality, special climate, uniqueness of the soil and the presence of elite vines, among which is the autochthonous grape variety Telti-Kuruk, has already become a landmark discovery on the world’s winemaking map. «The awakened giant» as Stéphane Derenoncourt likes to say figuratively. Stéphane Derenoncourt is a unique enologist, who combines an intuitive approach, revolutionary techniques, winemaking classicism and incredible performance. During one day the master tasted more than sixty samples of the famous Shabo premium wines, worked with the Shabo vineyards, inspected the production, visited the “Wine Culture Center Shabo” and even managed to give a brilliant interview. «Bravo, Shabo!» – with this phrase Stéphane Derenoncourt confirmed the idea that now in Ukraine we have a terroir wine of exceptional quality. For us, this is the best evaluation from the world-known expert and the best motivator from a friend for creating the first Fine Wine of Ukraine – Shabo Wine! 12 new medals in London! SHABO got 12 new medals in London! We’ve got the results of the 36th International Wine Challenge (UK). It’s one of the most respected international tasting competitions in the world. More than 10 thousand samples participated in the competition this year. And again, we one and only had the honor to represent Ukraine. Saperavi Grande Reserve Shabo wine received the highest gold award — 95-100 points according to the Parker, ahead of the winemakers of Georgia, the founder country of Saperavi. But we are especially proud to get a bronze medal for Pinot Grigio Reserve Shabo wine of 2017 harvest (86-89 points for Parker) at the “International Wine Challenge”. In Ukraine, Pinot Grigio wine is rare. To create it you need Pinot Gris grapes, which come from Burgundy (France) but reveals its best qualities on the soils of Italy. We started the creation of Pinot Grigio Reserve Shabo 7 years ago, when, after many years of research, we found in the terroir Shabo ideal soils for Pinot Gris grapes that can fully form an identity of taste and aroma in Pinot Grigio Reserve Shabo. Especially for these soils, we selected the elite seedlings of Pinot Gris, purchased them in Italy and planted them on these special micro-areas of the terroir in 2011. Pinot Grigio Reserve Shabo — a truly exquisite wine, fresh and harmonious. In the aromatic profile — the delicate aroma of citrus flowers, delicious notes of white peach. The wine has a clean, brilliant, golden color. The taste is fresh and rounded, aftertaste is rich and long. ⋆ The International Wine Challenge is an international wine tasting competition based in the UK and owned by William Reed Business Media (a business magazine and digital media company). ⋆ At the competition, wines are assessed on a 100-point scale (www.robertparker.com), loyalty to style, the uniqueness of the terroir and vintage of wine are also taken into account. Shabo has been cooperating with China for years. In order to increase numbers of deliveries in 2019, at the moment we are negotiating with new distributors. 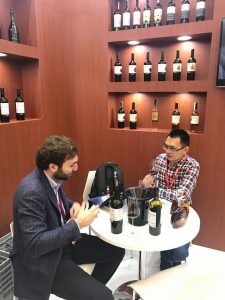 At INTERWINE China 2018 and ProWine China events which took place recently, Shabo presented its products at the world level. Our wines were appreciated by winemakers, importers, distributors, key buyers and wine industry experts from 39 countries. Many of them have been tasting the wine of Ukraine for the first time in a life and were pleasantly surprised by its quality and taste characteristics. Dry red wine Merlot Shabo is the winner of the bronze medal of the San Francisco International wine competition – 2017! This wine inspires with its unusually bright and intense aroma with fruit and berry tones, full taste and long aftertaste. You can find it in all supermarkets of Ukraine. Meet the newcomer – «Shabo Reserve» collection! Meet the newcomer – fortified and dessert wines in the «Shabo Reserve» collection! You will find 5 inimitable full-bodied wines: elegant white dessert wine Muscat, unique dry and dessert “Sherry”, bright pink dessert wine “Traminer” and excellent red dessert wine “Cabernet”. Dessert wines can be an excellent digestive, they are also perfectly combined with fruits, cakes, ice cream and other sweets. Everyone will choose a noble drink of his taste! Guests of the Wine culture center Shabo have already got acquainted with the newcomers presented in the “Shabo” brand store. Soon the new wines will be available in all major shops and supermarkets of Ukraine. Sauvignon Blanc Shabo is in the top three of the best wines of the world! This white dry wine was awarded with a bronze medal at the San Francisco International wine competition. Elegant and harmonious in taste with citrus aromas, spicy notes and gentle tones of peach Sauvignon Blanc Shabo is the best choice for warm summer evenings. Find this perfect wine in all supermarkets of Ukraine. Saperavi Shabo wine was awarded with the highest award DOUBLE GOLD at the San Francisco International wine competition-2017. Magnificent Ukrainian wine with a Caucasian character is created from the selected grape berries of the famous Georgian grape variety Saperavi. It embodies all the best – intense color, rich aroma and a long aftertaste. It’s a real masterpiece of winemaking.Look for Saperavi Shabo in all supermarkets of Ukraine. Is the best among Cabernets in Europe! Cabernet Reserve Shabo is the best among Cabernets in Europe! The wine won the first place in the category and a gold medal at the New York International Wine Competition! This was the first year of participation in this contest for SHABO company. 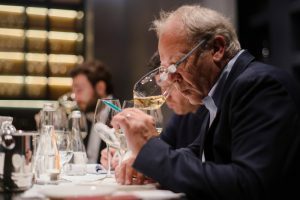 The main feature of the competition is a non-standard panel of judges, which includes professional sommeliers, restaurateurs, retail wine buyers, distributors and importers. Magnificent Cabernet Reserve Shabo with a fragrant bouquet of currant and cherry in combination with elegant oak tones will be appreciated by all fans of aged red wines. Last thing to add is that you can buy Cabernet Reserve Shabo in any corner of Ukraine and personally verify its high quality. Brut sparkling white Vaja Grand Cru was recognized the best in its class and awarded with a gold medal at the contest “Los Angeles International Wine Competition”. This luxurious aged wine is created according to the classical technology of champagnization in a bottle. It is made from selected grape berries of French varieties Pinot Noir and Chardonnay. These vines have been carefully chosen for the soils of the Shabo terroir and planted on our lands.